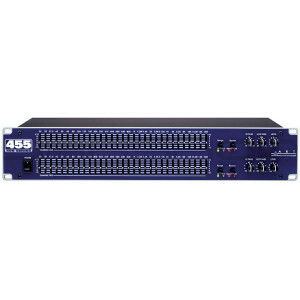 The 400 SERIES 455 Precision Graphic Equalizer has been designed and engineered to exceed extremely high standards for audio performance and functionality. This innovative, high-quality equalizer is perfect for critical audio applications where precision frequency tailoring, reliable performance, rugged design and extremely silent processing are absolutely essential. The 455 equalizer features active filter sections, which incorporate a Constant-Q design. This Constant-Q design, with extremely accurate precision center frequencies, ensures that the bandwidth of every individual filter will be narrow enough to prevent unnecessary interaction between filters, yet still create an equalization curve wide enough to produce the exact and precise processing of audio frequencies the user seeks. The 455 equalizer utilizes 20mm oil-damped precision slide potentiometers. These center-detented, precision sliders are graphically positioned at 1/3-octave ISO frequencies between 25Hz-20kHz. In order to deliver superlative performance and control, the 455 equalizer incorporates independent variable Hi Pass (low cut) and Low Pass (high cut) filters. Having separate and variable precision control for both the Hi Pass and Low Pass filters allows the user to custom tailor the audio signal to perfection. Many competing products only feature shelving switches, which have a fixed frequency point. Others do not have separate filtering for both high and low frequencies. These designs do not offer the control - or the precision - of an ART 400 SERIES equalizer. It also features automatic relay bypass of audio, an essential function if power to the unit is lost. Rugged construction and solid audio performance makes the 455 particularly well suited to fixed installation as well as touring live sound systems. The 455 equalizer utilizes a variable input level control, clip level indicator, ground lift switch, and selectable line voltage. Additional features include selectable Scale Switching - (High Slider Resolution 6dB - or Normal Resolution (12dB), active balanced and unbalanced input/output connectors, and RFI filtering. A passive Bypass switch allows for direct comparison between the equalized and non-equalized signal for each channel.